Nowadays, a sensor is used for older adults to detect their movement and to prevent fatal accidents. 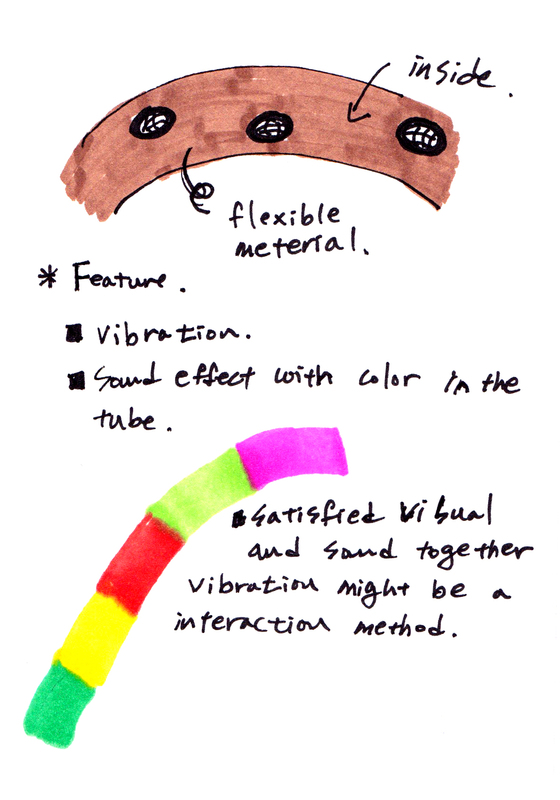 (Fig1) We learned how to map the sound of an area, and I made its connection to a sensor map, which can be made with time-based movements in a colored pattern. There are already sensor devices that perceive movement and send it to twitter, email, and a phone message; however, it just shows the number of usages of each sensor, there is no map of their movements. Comparing the movements of several age groups of people will provide critical cues about different life patterns based on age group behavior and create a representative age group movement map. In terms of finding their life style and behavior, mapping will be an important factor, because it is really hard to research older adults’ life style. Observing with a sensor is the easiest way to do this without bothering them. 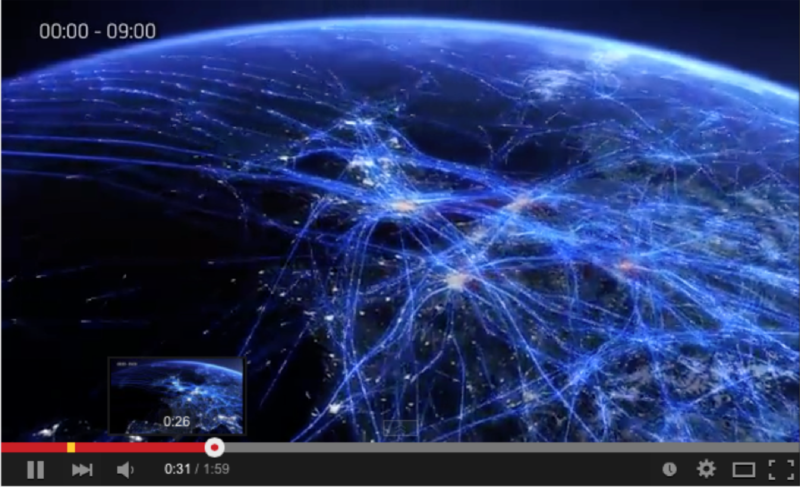 Figure2 depicts road traffic and flight traffic. The road traffic was accumulated by movement of lines and shows the location of traffic congestion areas. If time and frequency are presented in color vertically and horizontally, we can see their more detailed needs, patterns, and behaviors. I think the sensor map will help to understand older adults’ behavior and to help make a new device for older adults. Visual movement for older adults will be important in that they spend most of their time at home. If we know their daily routine by observing their movement, sound intervention should be a method to give them reminders to help them in their daily tasks, or to change their behavior. 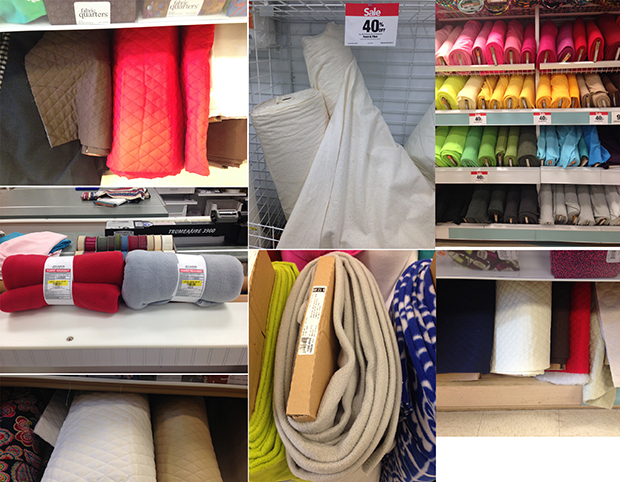 As a research method, we can conduct research on how sound intervention can change their visual pattern. Those devices that have sensors mostly provide sound functions for alerts such as reminders to take medicine or water, notifying payment dates, and checking temperature and humidity in the house. Wirelesstag, and Mother provide notices on variations such as the movement of doors, walking pace, temperature, humidity, sleep, refrigerator usage, medication, and teeth care with small tags that are attached on a variety of surfaces. (Figure4) The data is sent to the website or phone so users can check it immediately. We can gather and make a sensor map to investigate their movement. According to the Julian Treasure, sound affects us in 4 ways, physiological, psychological, cognitive, and behavioral. It affects most of our life. Brand sounds impacts people’s mind. One of the brand sounds, product sound help to keep a person’s behavior regularly, and help to change their behavior, affecting profit of products. This is one of my ideas that help older adults living individually. 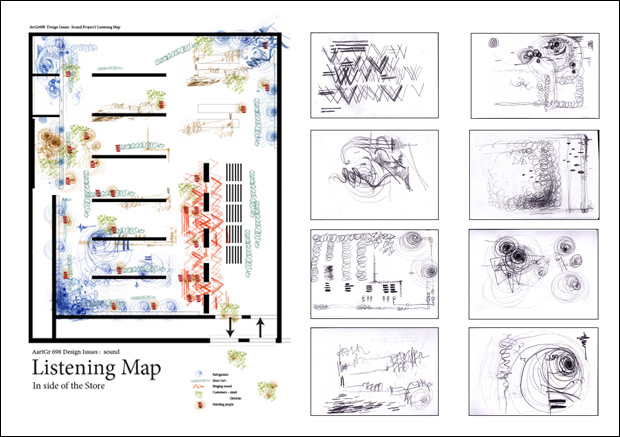 The visual sensor map will be a conceptual understanding of their behavior. There are many ways to understand people. I think it will be a one of methods to understand them. 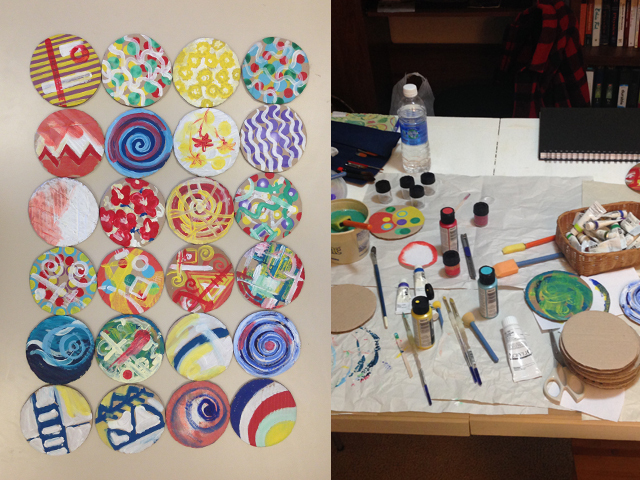 From the class of ArtGr698, we have learned the impact of sound when it combines with design. In the first project, I learned how to visualize sound, how it differs depending on time and situations. I did so by listening consciously and feeling that how the sound moves, what colors they have, and how the sounds changes over time. Therefore, I could make listening map. In the second project, I learned how to understand materials’ features by producing sound on it. Third project was related closely to interacting with people. 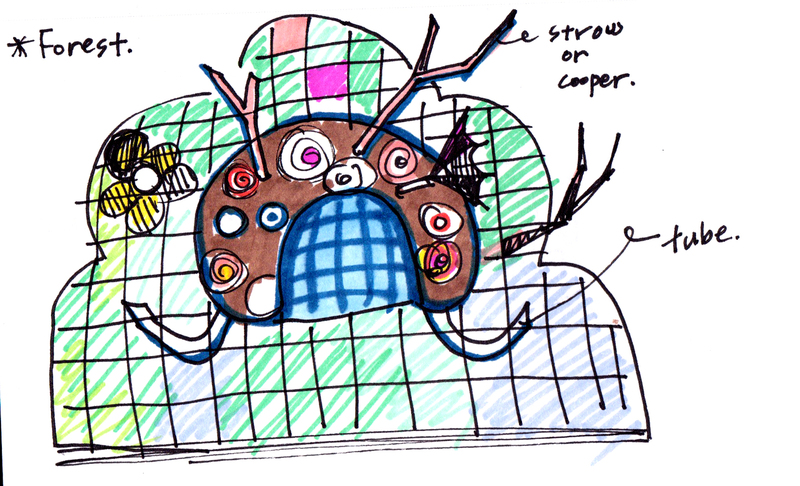 I learned how to interact with people with my design and sound by providing people with intervention. 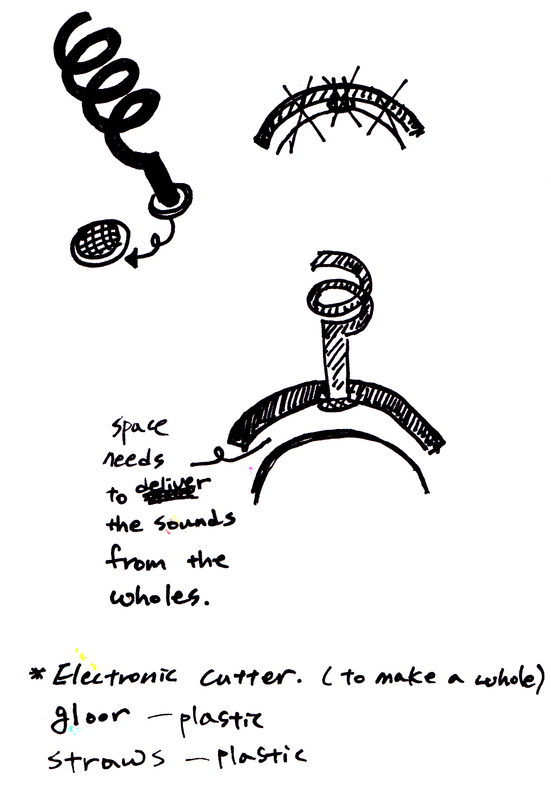 Lastly, forth project was to make an individual sound space with headphone in a specific context. It was not easy, but it was valuable time spent to learn about sound as a designer. Thanks to professor Alex Braidwood for letting us know the world of sound. Jennifer M. Ortman, Victoria A. Velkoff, and Howard Hogan. (2014). Current Population Reports. Sixty-five plus in the United States. (1995). Economics and Statistics Administration, U.S. Department of Commerce. Ljilja Ruzic Kascak, Dr. Claudia B. Rébola, Jon A. Sanford. (2014). Integrating Universal Design (UD) Principles and Mobile Design Guidelines to Improve Design of Mobile Health Applications for Older Adults. In ArtGr698, we have learned design+sound. It was my first time working on sound as a designer. It was such a new world. Even though I have used music as the background of a movie, I never thought it could be one of the genres of design. Reading articles and watching movies allowed me to learn about sound as a starting point with design. Closing my eyes and carefully listening to sounds around me was a unique experience. However, the question about how to map a sound was a strange requirement for project 1 because I have never thought that I could draw sound. Asked one place to listen to sound and the number of required visiting was twice. A place which first came to mind was the Fareway store in my neighborhood, which is familiar with me; I visit at least once a week. I made a big structure of the store to separate sections on it. 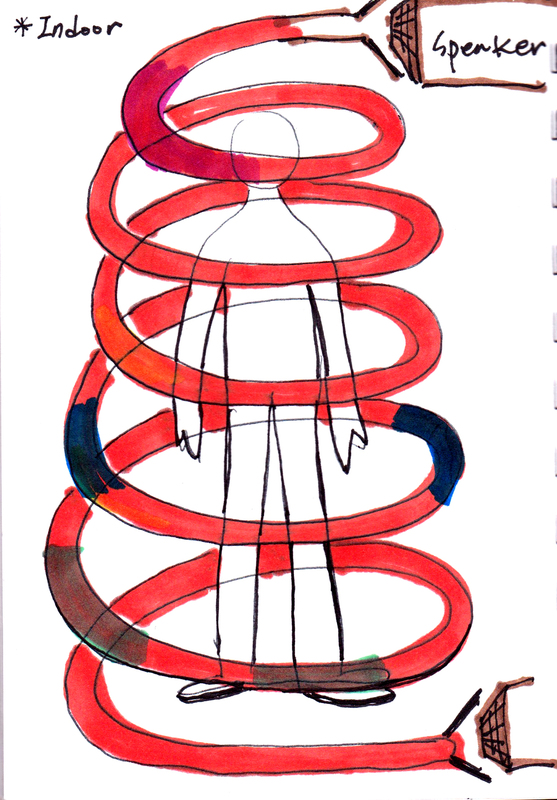 After that, I visited each section to draw sounds, by listening to sounds around it. Each section had different sounds depending on its functions. For instance, daily product had huge electronic sounds, meat section produced a lot of conversations with people, asking their needs and helps, and counter section produced tagging pick sounds of barcode readers. I tried to listen to differences from each section. Also, I used different colors to designate features such as blue for refrigerators, green for the conversation of customers, brown for the service clerks, and red for the counter. Lastly, I focused my attention on listening to intonations of the conversation and volumes of the sound. Producing an image of the sound was not easy and I had to depict the feelings that I got from the sounds. It was an interesting experience. In this class we made a small microphone to be used as a tool of making sound. The second project was that of making sounds with design principles. I was excited at that time because the tool that I made produced sounds. I chose my wristwatch, which has patterned texture on the bands and has the sound of the watch hand to record sounds. I tried to produce sounds from most surfaces of the watch and wanted to use the turning sound of the watch hand as a background sound. In particular, the bands made unique sounds that can be used for many design principles. Unfortunately, I could not record the original sound of the watch hand turning, so I used a sound that I made with my wristwatch that is similar sound with the watch hand. 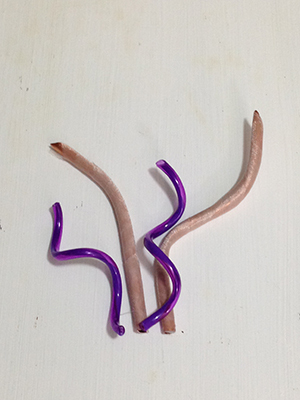 Also, I used other materials to generate sounds such as brush, plastic stick, and microphone. The process to make all sounds was so exiting because there were sounds I made were out of my intention and some good sounds that were unintentional. My next goal is to mix sounds with what I made and make a story about "Time" in terms of my object, a wristwatch. The aim of this project was to make a sonic intervention that interacts with people with sound. 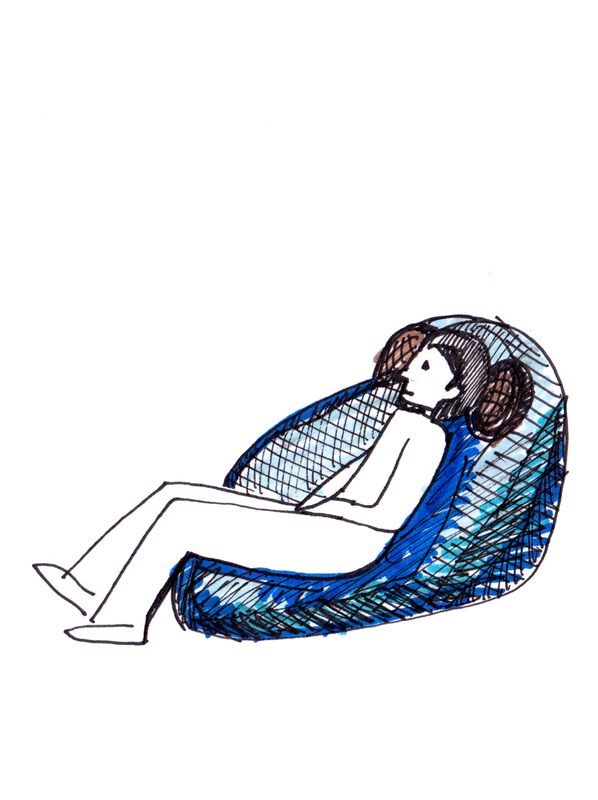 I made a story with questions about how I could give people a moment to enjoy during busy days. I focused on exploring the process of the activity. What I chose for that activity was candy game. It was so simple to execute. I made disks that users could use to make a goal into the basket. After gaming, as a reward, they could get some candies. I set up the game with two speakers near it and produced fake interaction sounds to encourage players while playing the game. Actually, I did not like the candies that I used for the game and they were waiting to be consumed at home. It was a good opportunity for me because I could provide people with an enjoyment and they could consume all the candies that I did not like. 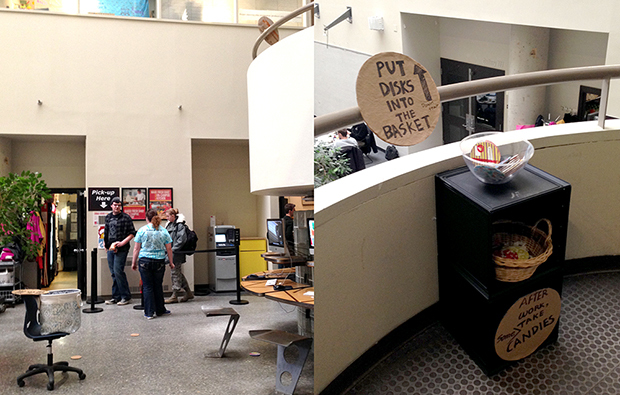 I placed the game in COD building in the short stairwell and provided instructions, asking people to shoot disks into the basket on the first floor. Moreover, I generated fake sounds to encourage their activity while watching their reaction, like the machine reacting with their movements. First, I asked my friend to play it as a preview game. He argued that it was so hard to make a goal, and asked what is the rule for loosing the game. Moreover, he asked whether he needed to put the disks back in the basket after the game. I tested the game afterward; however, his arguments seemed too concerned about the game. It may be his personality. The game continued and I had to move up and down to pick the disks from the first floor near the basket and to change memory cards in the video cameras. I installed two cameras and took videos in four different places to provide different perspectives. Second, I found a really interesting reaction from the instruction. I used a bowl for disks and a small whicker basket for candies. The basket they had to put disks in was on the first floor; however, after reading an instruction they searched for the basket they could put disks in and they chose the basket for candies. Therefore, I had to put an arrow on the right side of the instruction to guide their eyes and exchanged the containers; the bowl for candies and the basket for disks to avoid thinking that the basket is the basket for candies. With several tests and observations, I found people reacting more when they listened to music or sounds coming for interaction of their movement. If there were no sounds, people easily skipped the game; however, they acted more actively, when sound interacted with players. It was an exciting observation. 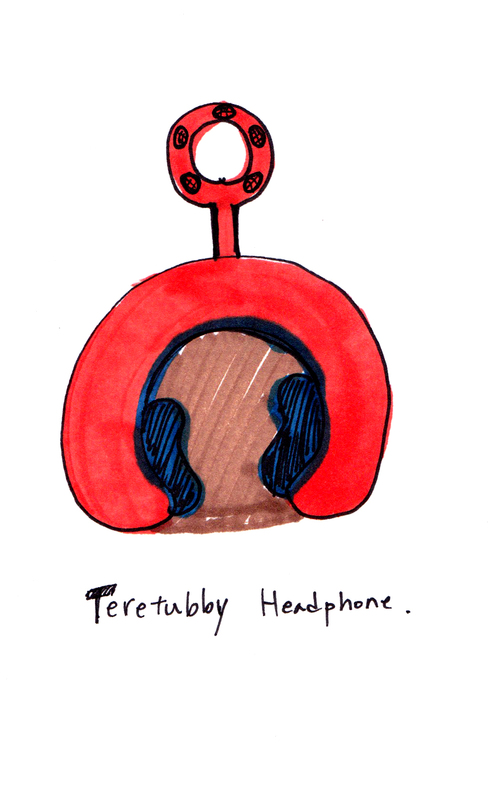 The goal for project four was to make a headphone in a specific context. 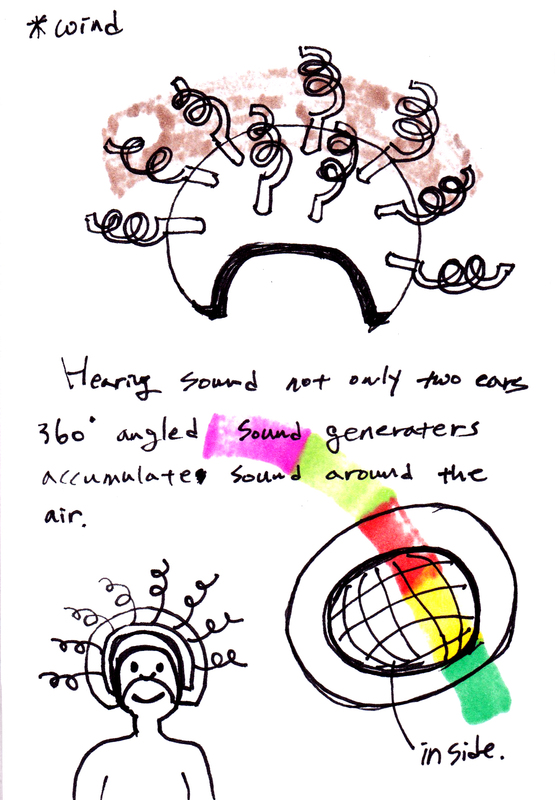 What I prepared for project four was to make a headphone to generate the sound of wind. The area where I am living has topographical features that produce strong wind and tornados especially in spring. 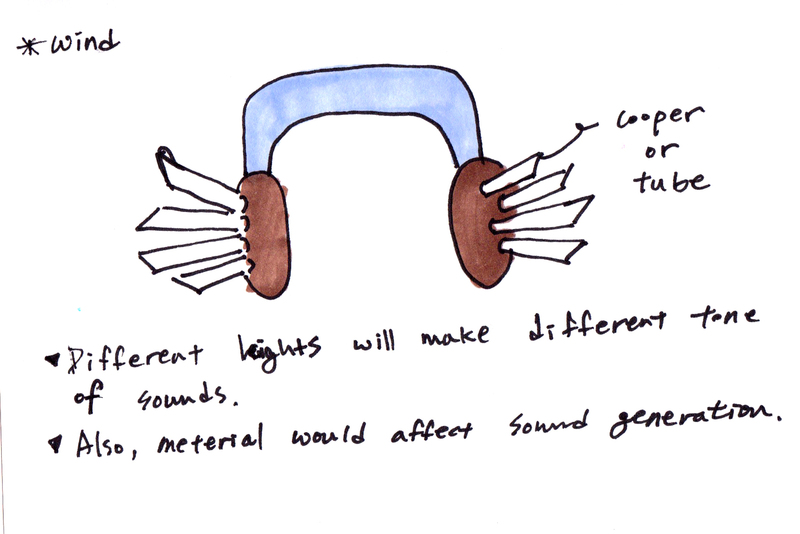 I want to make a headphone that could hear sounds from every angle around us. Therefore, I chose a helmet for the headphone. I planned how to generate sound into it and what kind of shapes needed to produce harmonious sounds. It was not difficult to penetrate holes in the helmet; however, it was time consuming work. Accumulating wind sounds from the outside was not easy work. I had to try several methods to make clear sound. The sounds were not clear from what I could hear and a lot of bothersome sounds came along with it. I had to use a small microphone to record the sounds. Also to avoid the other sounds to be recorded from outside such as people, cars, other materials' sounds, I recorded wind sounds alone and added it when editing the movie. I think more then six recordings were attempted to get clearer sounds. Searching for the places where strong wind blows was the other challenge of the project. Between the buildings was the perfect place I could record sounds. It was an interesting activity that I could use several different materials for the decoration of the helmet and thinking of the directions where wind sounds would come with ease. 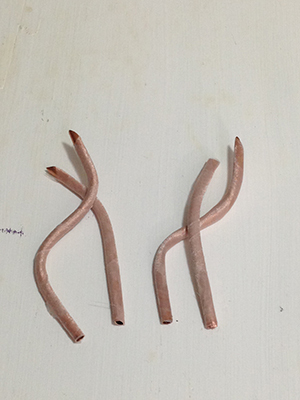 To provide more natural feeling, I used lace rolled on the surface of the tubes. What surprised me about this project was my helmet produced harmonious sounds. When preparing it, I was curious about what kind of sound it would generate. The sounds were so beautiful and unique. If I can make the other helmet producing unique sound, it will be a more fun project since I have the experience making it. The objective of this project is to make a helmet to hear the wind sound in the Midwest. Ames is such a place that has strong wind especially in spring. Midwest topography allows warm temperature and cold temperature to meet at the center of the area and make the temperature fluctuation, which causes tornados. Thanks to the topographical feature, Ames has strong wind. Our ears can hear only sound from the sides. Winds blow from everywhere and I wanted to funnel it into the helmet by using the straw shaped tubes and pipes on the helmet. Tubes and pipes of different shapes make different sound and curved shapes make mysterious sounds. The sound comes through the tubes and pipes and it made a harmonious sound. The inside of the helmet has a space, in which sound can spread out. Also the fabric ends of the helmet hanging near the ears help trap air that hinders hearing the sounds inside of the helmet. Funneling wind sounds from the outside was not easy work. I had to try several methods to make a clear sound. The sounds were not clear as I could hear from my ears and a lot of bothering sounds came along with it. I had to use a small microphone to record the sounds. Also to avoid recording the other sounds such as people, cars, other materials' sounds, I recorded wind sounds alone and added it when editing the movie. I think more then six recordings were attempted to get clearer sounds. Searching for the places where strong winds blow was the other challenge of the project. Between buildings was the perfect place I could record sounds. A lot of time was spent to penetrate holes in the helmet. However, it was an interesting activity because I could use several different materials for the decoration of helmet, thinking of the directions where wind sounds would come with ease. To provide a more natural feel, I used lace rolled on the pipes. Once I thought about using colors on the helmet and pipes; however, I decided to make it with a more natural feel. Can you remember these sounds? Recall your lost memory with sounds that you heared long time ago. Ames is such a place where has strong wind especially in spring. Midwest topography allows warm temperature and cold temperature meet at the center of the area and to move it up and down frequently; it makes temperature fluctuation, which introduces several tornados. Thanks to the topographical feature, Ames has strong wind. The objective of this project is to make a helmet hearing the wind sound in Midwest. Our ears could hear only sound from two side of the space. 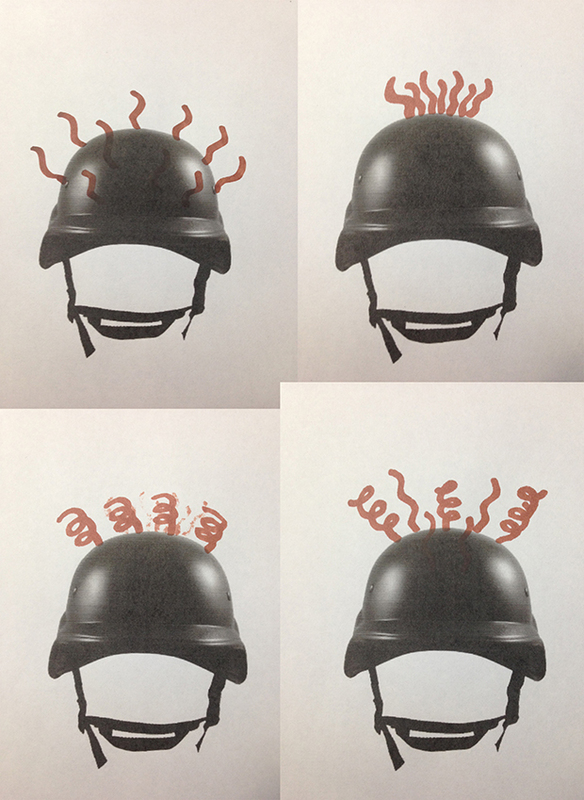 Winds blow from everywhere and I want to accumulate it onto the helmet by using the straw shaped tubes and pipes. Size of the tube and meterials made different sound and curved shape might make mysterious sound. The sound will turn around on top of my head in side of the helmet and it will make a harmonious sound. The developing helmet is still in process. I will use cooper pipes with curved shapes. To make a better appearence, curved shapes should be decorable each other. It is a sample of idea used for brain storming. Also, I was thinking about curves of pipes, not too much superficial in bright colors. I think it is possible that curves of the pipe will make a different feelings and give a harmonious decoration. The headphone I chose for this project is a helmet headphone that people can hear wind sound outside. Iowa is such a place having strong wind, which leads lots of tornados. Also, in Ames, there are couples of wind power plants to get power from the strong wind. What is the wind sound? My question was started from this question. How I could gather wind sound. 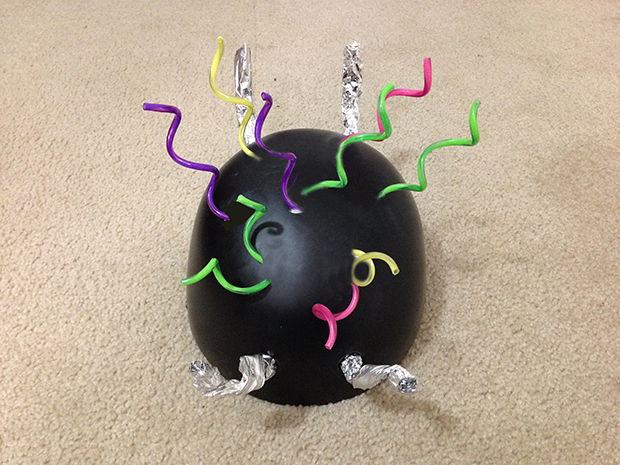 I chose a helmet for the project to accumulate the wind sound. The problem what I am concerning is the size of helmet and a space inside that allows sound circulate in it. I will penetrate wholes with an electronic cutter and finish it with glue gun. In the first attempt, I need to discuss is that of a helmet design how it will be shown. I have to consider whether I will use original helmet or manipulate it with another materials. I want to show it with natural feeling and cuppers, should be covered with other materials to conceal metal appearance. Second, covering of ears. Ears need to cover with another materials since the helmet cannot cover all ears while wearing it. Now I am waiting a delivery of helmet. After receiving it, I will figure out what I need to do for a next step. 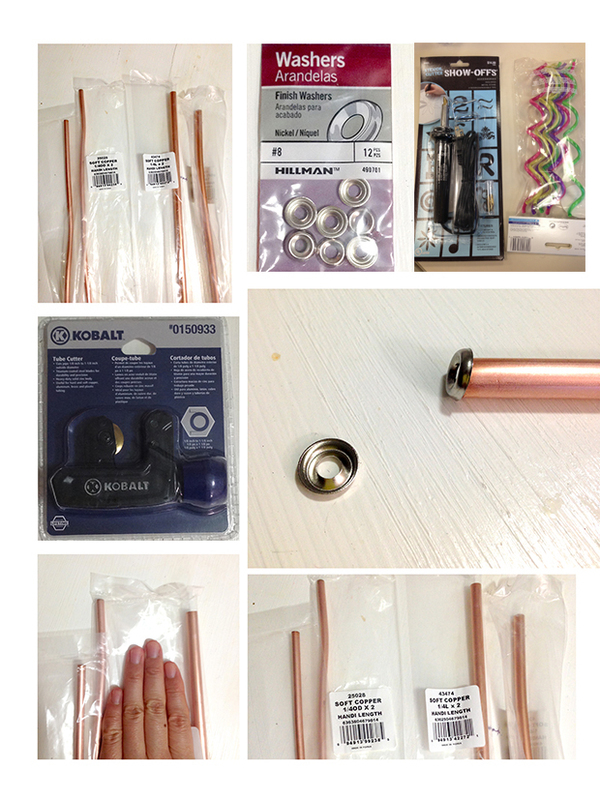 I searched a lot of materials I could use. Contexts what I choosed to make headphones were Indoor, Wind, and Forest. Not only headphone for ears, but also for eyes and a body. Transparent tube reflect colored lights depanding on the volume of sound from the speakers. Sound vibration will be one of the effects for this headphone. 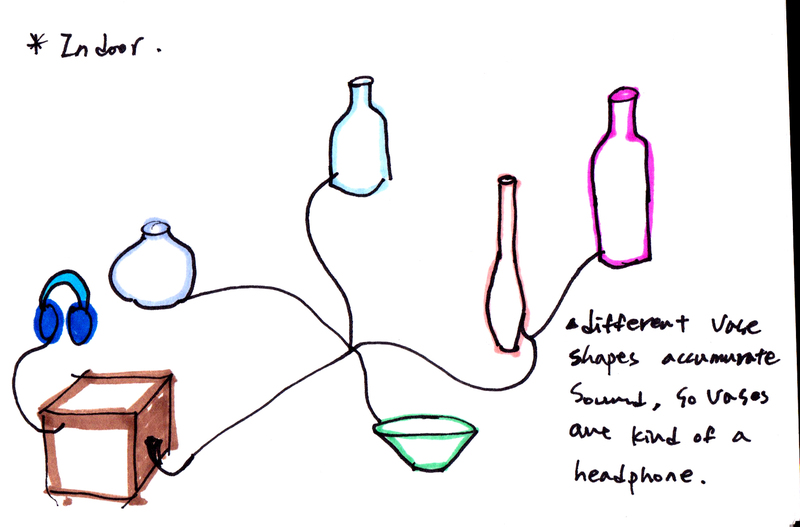 Different shapes of vases acumulate different sounds, so I planned to make a visually, and acustically satisfied installation to make a different type's of headphone. Its weight and space will make different noise and sound. The musin could be accumulated in one place and people can hear that sound with huge headphone. It is a huge headphone and installation sound art. 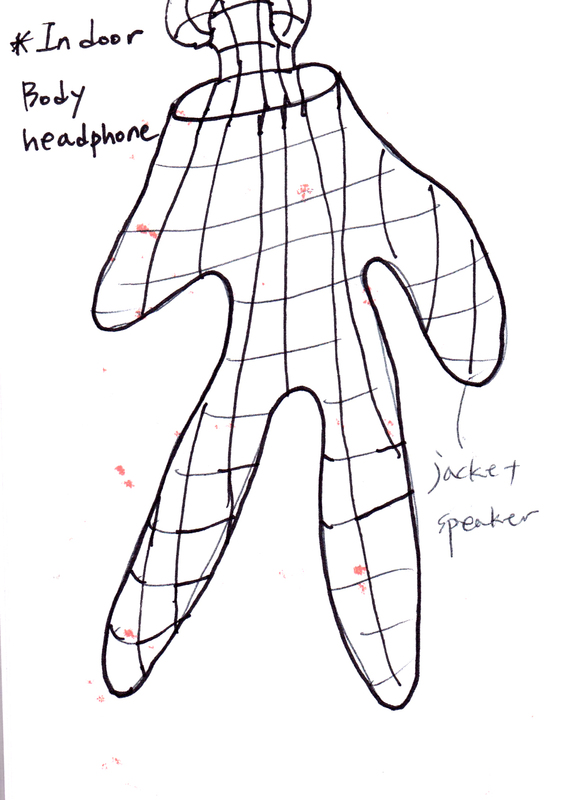 Wire based clothing with speakers inside of it would make differnet sound and it would be one of the headphones. Person can hear the sound in an enclosed area. People do not need to wear a headphone. Flexible meterial will make suitable shape of sofa and the surface of it provide a sound or music. To gether a sound of wind, tubes will be installed surface on the helmet. Inside of it has wholes to hear the sounds caming from outside. 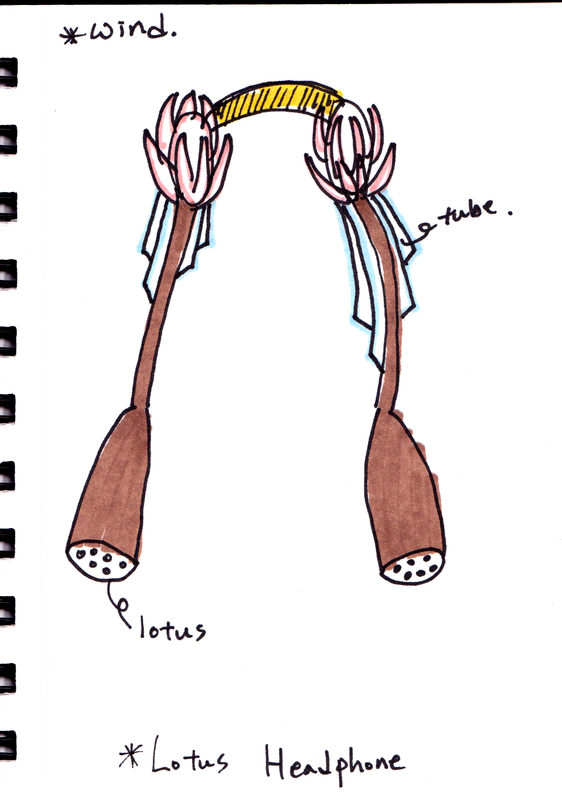 I was thinking about a lotus flower which has seeds inside because the shape of the flower. So I was thinking about similar design of headphone. Top of the ring accumulate sounds from outside. The aim of this project was to make a sonic intervention that interacts with people using sounds. I made a plan to give people a enjoy moment while busy days. I prepared a compensation of candies for people who played a game. Instructions are installed on the desk. I led people to follow the instructions and observed what was happening during a game. In the first attempt as a process, sound effect was not working only background music was settled, so feedback was not generated effectively. Another problem was performing time that was not appropriate to play the game. There were only few students are passing by the game place, and I could not gather enough experiments to record a video. One thing, I found at the first attempt was that if there is no music, people just passed the game place even without glance at it. People needed some motivation to play a game. Music was a motivation method, and also a way of offering different experiences through different sound effects. In the final, from the suggestion in the class, I moved the place where the game would be conducted. I set up two sound devices, background sound with one iPod and effect sound with one bluetooth speaker to be manipulated by me computer. I chose different places to take videos to observe people’s behaviors while playing games. I had to spend two hours for setting and two hours for shooting the videos. However, in the last attempt, I found many interesting moments. First, my friend argues that it was so hard to make a goal, and asked what is the rule for unsuccessful a game. Moreover, he asked whether he needed to put the disks back to the basket after the game. I tested the game; however, it seemed like too much concerning about the game. It should be his personality. The game continued and I had to move up and down to pick the disks from the first floor to the basket and to change memory cards on the video cameras. 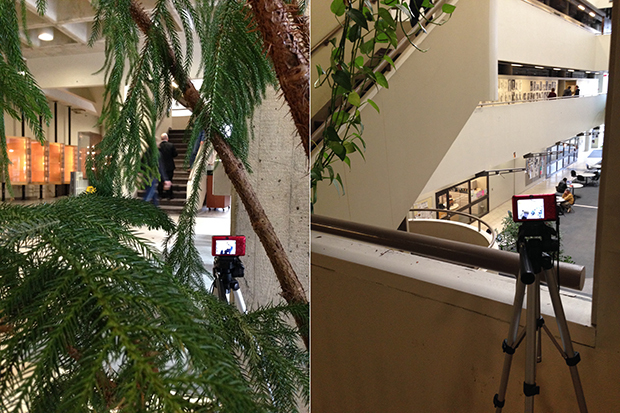 I installed two cameras and took videos in four different places to provide different perspectives. Second, it was a really interesting reaction from the instruction. 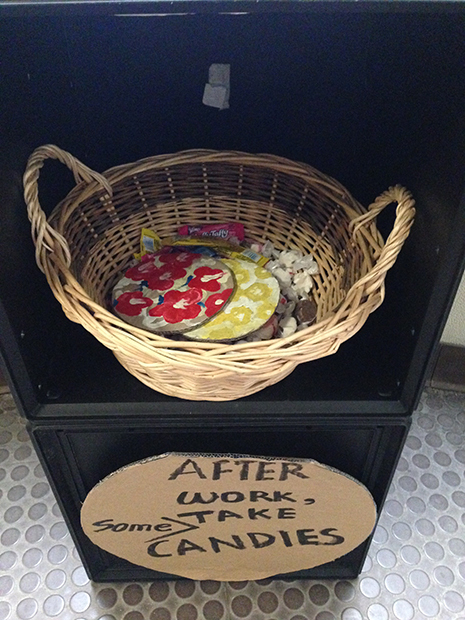 I used a bowl for disks and a small basket for candies. The basket they had to put disks was on the first floor; however, after reading a instruction they searched where the basket is, they could put disks, and they chose the basket for candies. Therefore, I put the allow on the side of the instruction to lead their eyes and changed the containers; the bowl for candies and the basket for disks. Third, There were many thieves. It was not difficult to play game and get some candies; however, the place was not opened place, so many students take candies without gaming. Nobody doubts that there were cameras to take their behaviors. I played game with friends to explain what it is and spent time with them. It was such a fun experience. I found from the observation was that people react on immediate sound effect and more interested in direct interaction rather then just playing with background music. Interaction is a technology's communication method with people.